The original metallic object (a) is covered by a ghost device that scatters incoming light waves resulting in two ghost images on either side of the morphed object (b); the metallic object is shruink here in the middle of two wing objects (c). Ghostly illusions could one day help disguise military aircraft for greater stealth, researchers say. In the last eight years or so, scientists have discoveredcloaking devices are possible, which can bend and twist light completely around objects, rendering them invisible. 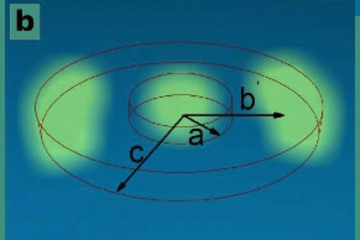 Cloaking devices that work against other kinds of waves are possible as well, such as the acoustic waves used in sonar. However, such cloaks are usually limited to working against narrow ranges of frequencies for various types of waves. An international team of physicists instead explored devices that could potentially work against wide bands of frequencies, generating illusory ghosts as disguises. “Our work has enormous potential to enhance our ability to mold, harness and perceive waves at will,” said researcher Cheng-Wei Qiu, a physicist at the National University of Singapore. PreviousCardinal O’Brien Resigns: Church In Crisis Monday – Surprise! Surprise!